The purpose of engine mounts are to secure the engine to the chassis. They also reduce the vibrations and movement of the engine within the vehicle and when there is an issue with them, the symptoms are pretty clear to the driver. They are usually made up of metal, rubber and oil, which come in a range of shapes and sizes. They are fairly cheap and there are various engine mounts to buy from OEM to Aftermarket. As shown in the photo above, a worn engine mount is easy to notice when they are out of the vehicle. However, they are hard to visualize on the majority of cars because they are underneath the engine itself. Fully functioning engine mounts are required to ensure no further damage is caused to the engine compartments and vibrations do not pass through the car. Below are 5 symptoms that you will notice if you have worn engine mounts. Excessive Vibrations. The most obvious symptom of a worn engine mount is the large amount of vibrations throughout the car. The rubber around the engine mount is usually worn or perished causing the vibration. Movement of the Engine. The purpose of engine mounts are to secure the engine in place but if they are failing, they will not accomplish this. When worn, the engine will move much more freely under acceleration and come in contact with other engine components that can cause damage. Bangs from the Engine. If the movement of the engine isn’t enough, the impact noises are fairly audible. From slight acceleration to even revving the engine, you may be able to hear knocking noises. Misaligned Engine. 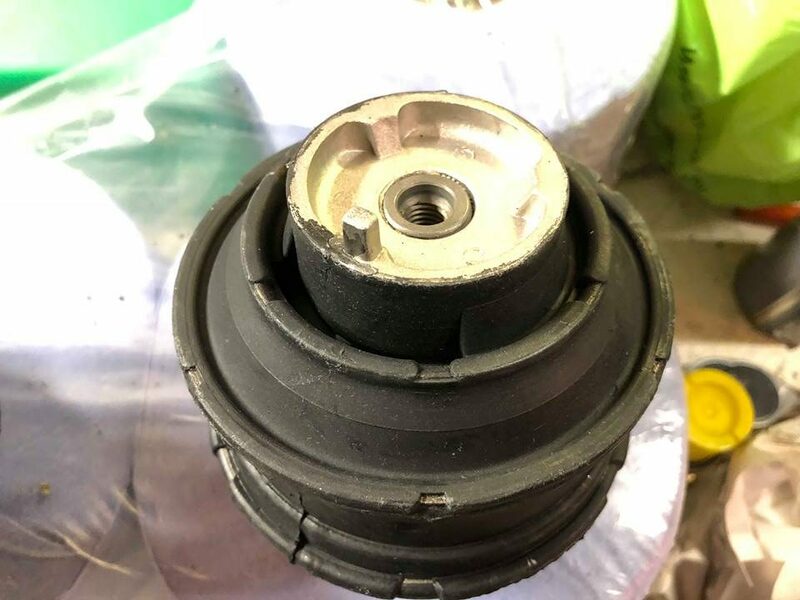 Worn mounts become squashed and smaller in size, meaning the engine can look misaligned and cause unequal heights causing the engine to lean to one side. Damage to Engine. 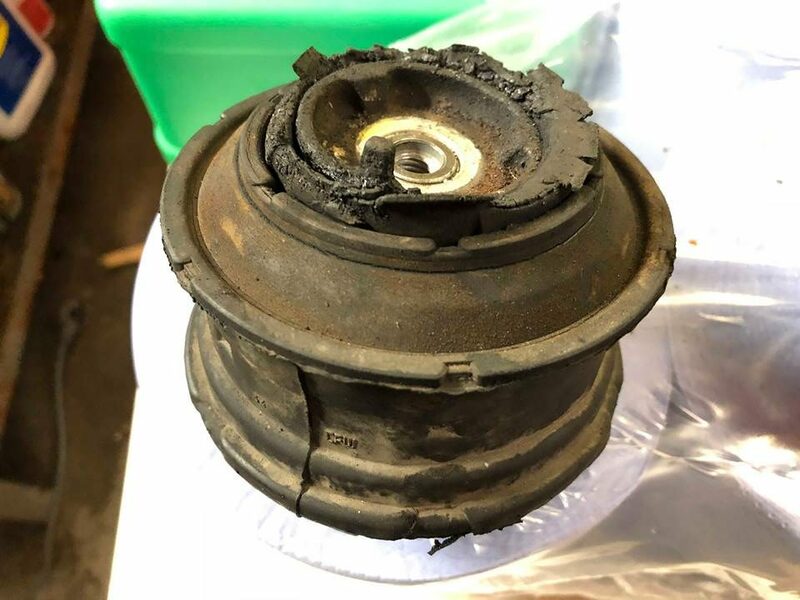 The movement and vibration can cause damage to engine components or parts connected to the engine. Such components can include exhaust manifolds, EGR valves and anything connected to the engine. Driving on broken engine mounts will get worse over time and eventually the mounts could less loose and break free of the transmission. However, if you must drive your car with worn engine mounts in order to drive to the garage, try to accelerate as gently as possible thus reducing the movement of the engine. Heavy acceleration will cause the engine to move even with good mounts, so you want to avoid this completely. This is a worn engine mount taken from a Mercedes E Class that was suffering the dreaded excessive vibration. As you can see, the rubber has become perished and worn. Another sign is that it has become compressed in size resulting in a lot of engine movement. The replacement engine mount clearly has much more rubber and is bigger in size. This adsorbs all of the vibrations from the engine and fixes the issue of discomfort throughout the car. Its important to note that not all engine mounts look the same and many give different symptoms to the driver. All cars have different ways of bolting the engine mounts from the chassis to the engine. Mobil 1’s guide offers a great example of how to change your engine mounts.